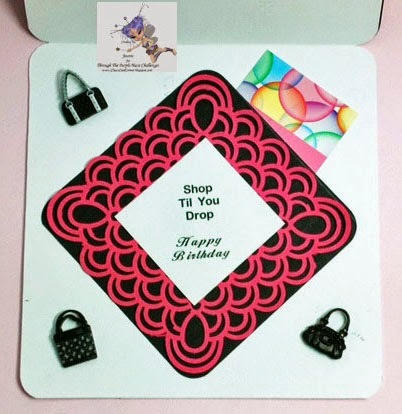 Joanie's Classy Card Corner: Shop til you drop!! Hi all, glad you're back to visit. If you are here for the first time, please feel free to browse around and I hope you enjoy what you see. Well, I am back this time with my inspiration card for Through the Purple Haze Challenge "Button It Up". So I did just that, but I found some of the cutest buttons!!!! So here is my card and I decided to also do the inside for the challenge. Let's get going!! Since I decided to make a Birthday Card and I used the sentiment "Shop Til You Drop" I also made it a gift card and have a pocket for a credit card or cash. Cardstock is Recollections from my stash. The die is Martha Stewart. The pink ruffled ribbon is from my stash also, which probably is from Hobby Lobby. 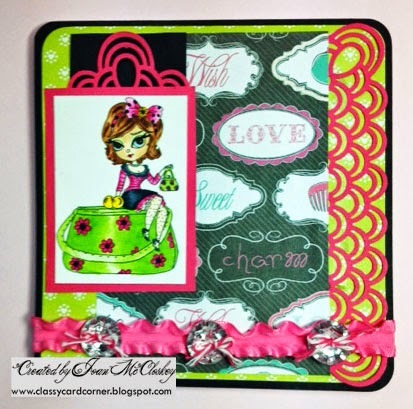 The patterned paper is a Recollections 12"x12" Paper Pad "All Girl". The three Bling Buttons on the card front is from Close to My Heart "Bling Assortment". The inside Purse Buttons are from Dress It Up, "Posh Purses". And last but definitely not least is the image from our generous sponsor, Lacy Sunshine, "Daisy Delight" and that she is, a true delight and just too cute. I colored her with my Copic Markers. So now it is time for you to get your image or whatever technique you want to use and get it entered into this weeks challenge. 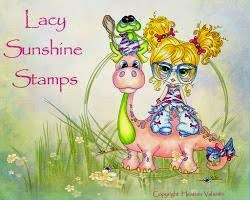 There is going to be an awesome prize...... $20.00 gift certificate for images from Lacy Sunshine Stamps. I can't think of a more awesome prize!!!! F-A-N-T-A-S-T-I-C !!!! !